Each question type has a unique Item Editor. This guide describes the tools and options available in each one. CHECKBOX TIP: A preview of the item will display on the right when selected. Note that this is just a preview and not necessarily indicative of what your final question will look like. 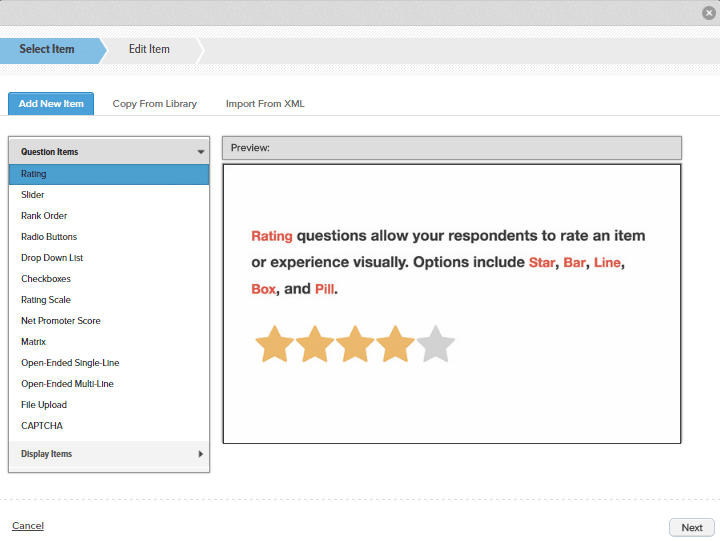 The Rating question allows respondents to rank an item or experience visually using a star, box, pill, vertical bar, or horizontal bar layout. The Slider Item allows respondents to drag a key along with a horizontal plane and drop it at the desired value along the path. 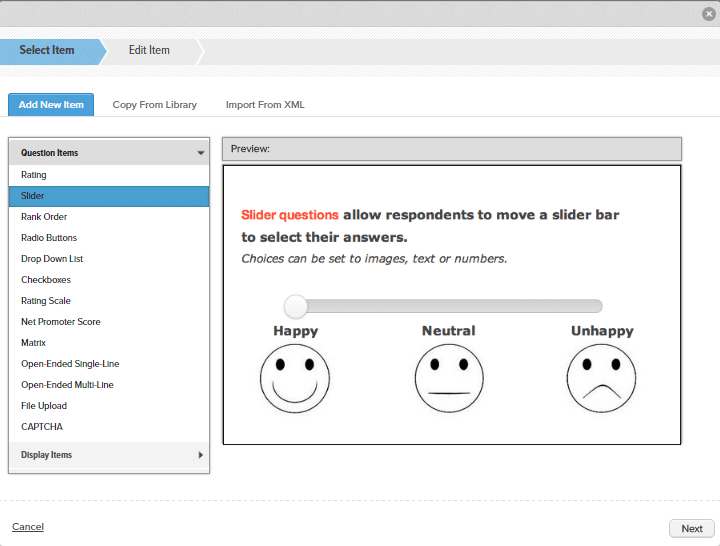 Slider answer values can be configured as a numeric range, or with a custom image or text answer choices. For details on the Slider Item, please view the Slider Item Guide. The Rank Order item allows respondents to rank possible answer options by either assigning each item a numeric ranking or by physically positioning items in a specific rank order. 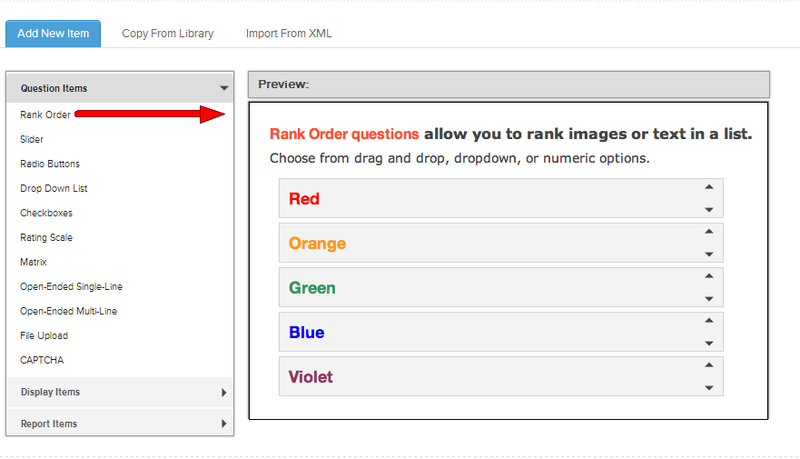 For details on the Rank Order item, please see our Rank Order Guide. Radio Button questions present a list of possible answer options from which only one option can be selected. You can toggle between main question text and the question subtext. The <> button opens up the HTML editor if you need to edit the HTML directly. 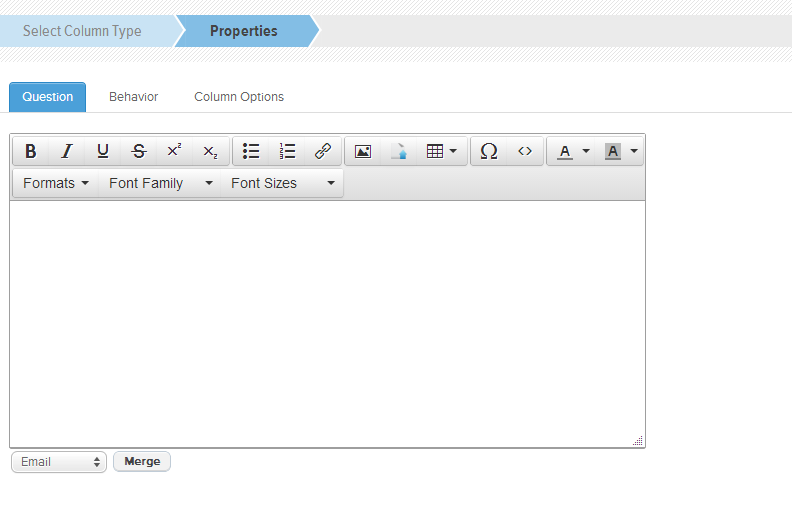 The toolbar icons allow you to insert images, create tables, change font characteristics, create links, and more. 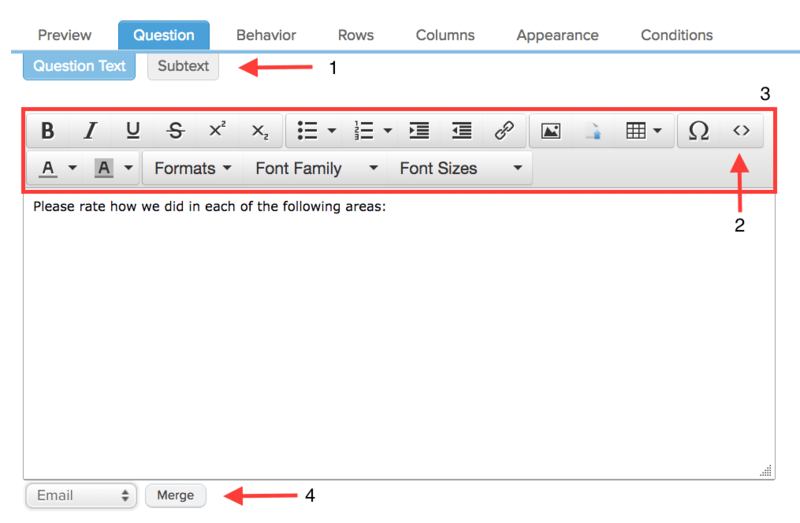 Merge in text from previous questions, User Attributes, or Response Properties using the merging dropdown. 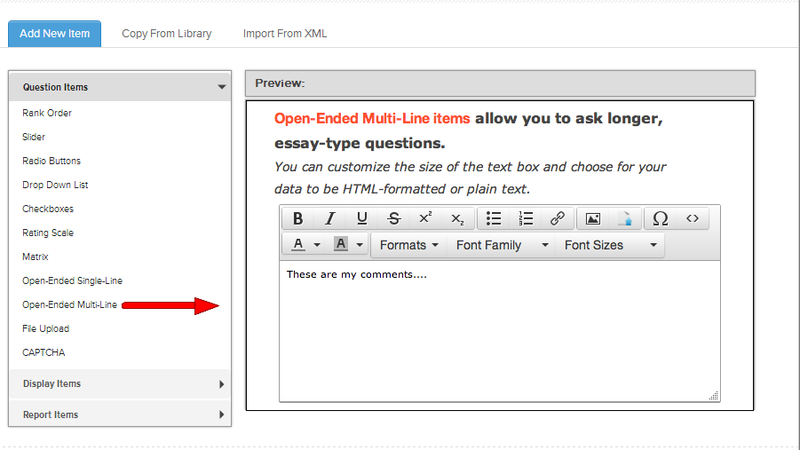 You can enter answer choices line by line in the Normal View or toggle to Quick Entry to copy and paste. Select the orange ‘+’ icon to add a line. Select the red ‘-‘ icon to remove a line. Click into the row to edit. Rearrange answer choices by selecting the dotted lines and dragging the answer choice to a different position. 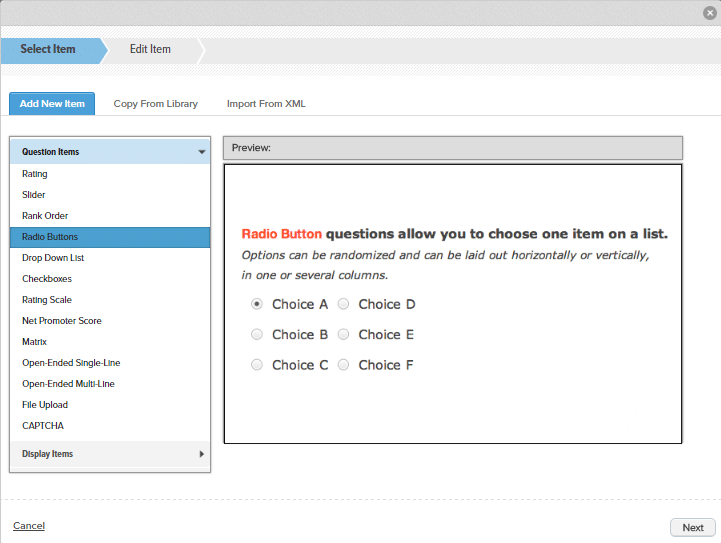 Select the Default Text radio button to the left of an answer choice to have that option pre-selected in your survey. 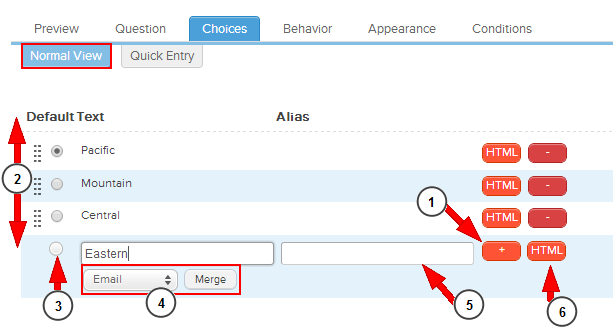 Use merging to insert the answer from a previous question, User Attribute, or Response Property into the answer choice field. Create an alias for each answer choice (optional). This alias acts as alternate answer text and can be applied to reports or when exporting response data. 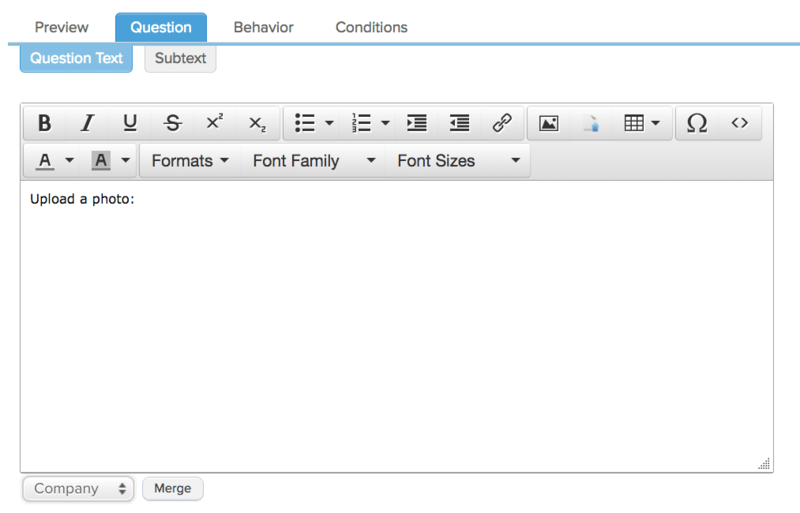 Edit the question text with the HTML editor. Create a question alias. This alias acts as alternate question text and can be applied on reports or when exporting response data. Check “Answer is required” to make this a required question. Respondents will not be able to proceed in the survey until an answer is selected. Check “Randomize Options” to randomly reorder the answer options for this question every time the survey is opened. Randomizing answer options can help prevent answer bias. Check “Allow Other” to allow respondents to enter their own answer instead of selecting one of the answers provided. Enter default text into the “Other” text field to prompt the respondent. You can also apply merging here. CHECKBOX TIP: Reports and exported data display the text from your survey editor. This means that if you used merging in your question text, the six digit source value code that was applied to your question will appear in your report/export. This is an example of when you might want to create an alias for your question text to apply when generating a report/export. 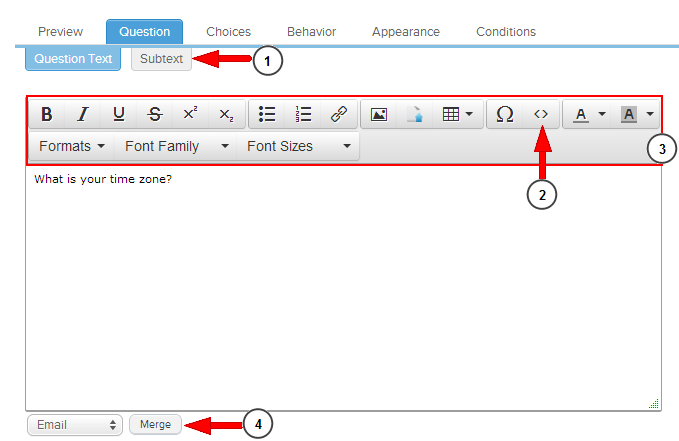 Change the position of the question text in relation to the answer choices, Options include top, bottom, left or right. Change the justification of the entire question in relation to the survey content frame. Options include left justified, right justified, or centered in the window. Change the layout of the answer choices. Choose between Vertical and Horizontal. Arrange answer choices into columns to avoid scrolling. Especially handy when you have a long list of answers. Show number labels to the left of answer choices. Click New Condition and create one or more display rules based on answers to previous questions, user profile properties, or response properties such as survey score. Read more about Conditions here. Like Radio Button questions, Drop-Down List questions allow a respondent to make only one answer selection. Drop-Down Lists are useful for hiding a long list of answer options. Create an alias for each answer choice (optional). This alias acts as alternate answer text and can be applied on reports or when exporting response data. 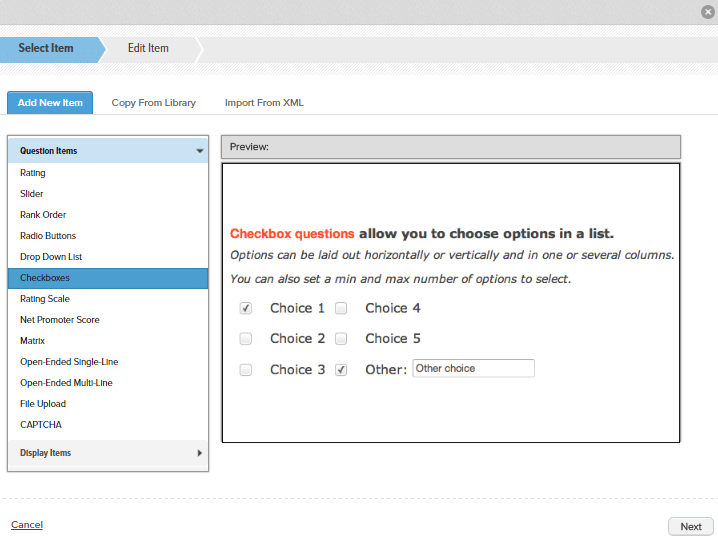 Unlike Radio Button and Drop-Down List questions, Checkbox questions allow a respondent to select multiple answer options from the list of answer choices. 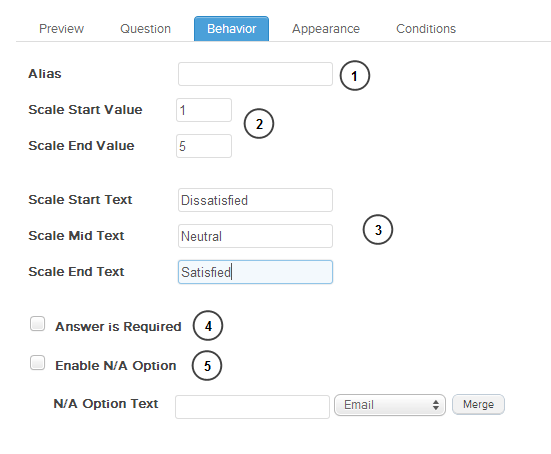 You can specify the minimum and the maximum number of answers a respondent is allowed to select under the Behavior tab. A Rating Scale question displays a consecutively numbered scale, the range of which can be customized under the Behavior tab. 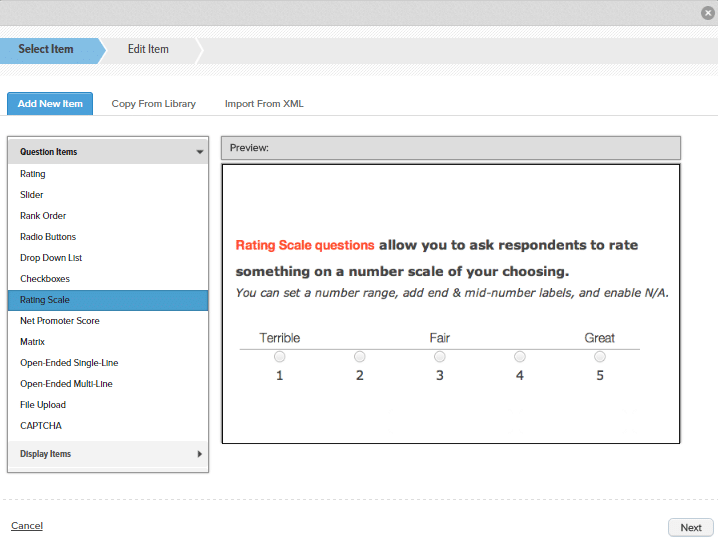 Rating Scale questions allow a respondent to make one answer choice from the scale range. CHECKBOX TIP: When generating a report, the Rating Scale and Net Promoter questions are the only item types that allow you to use the Statistics Table report item. 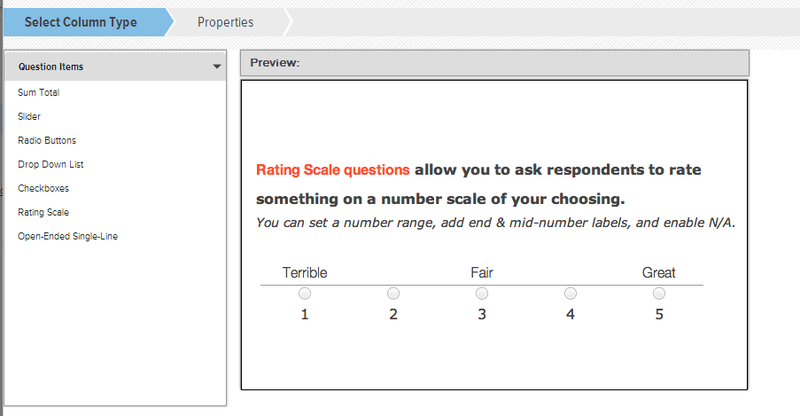 NOTE: The Rating Scale question does not have a Choices tab. You can customize your scale numbers and text on the Behavior tab. The number entered in the Scale Start Value field will be the first number in your rating scale. The scale will increase in numerical order until the End Scale Value is reached. A radio button will sit above the each number in the scale. There is no limit to the size of your scale. Scale Start Text sits above the first number in the scale. Scale Mid Text sits above the middle number(s) of the scale. Scale End Text sits above the last number in your scale. Make sure the start, middle, and end text are assigned to the correct end of the scale. For example, if you display a scale from 1-5 and 1 is equal to very dissatisfied, make sure “Very Dissatisfied” is entered in Scale Start Text, not Scale End Text. Scale text is optional. Check “Answer is required” to make this a required question. This will place an asterisk (*) to the left of your question text. Respondents will not be able to proceed in the survey until an answer is selected. Checking “Enable N/A Option” will place an additional radio button to the right of the rating scale. Customize the N/A text in the field provided. You can also apply merging here. Change the layout of answer choices. Choose between Vertical and Horizontal. Change the position of the question text in relation to the answer choices. Options include top, bottom, left, or right. Include a separator line between the scale number scale description text. Set the width between scale increments in pixels. 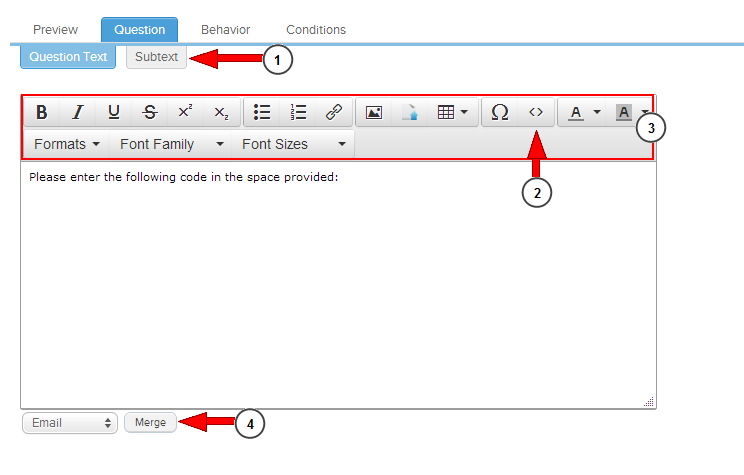 For example, if you enter 100px in the text field provided, each scale option will be 100px apart. Matrix items contain rows and columns that make up a grid of questions. Every row/column combination is a unique question. Create a Matrix alias. This alias acts as alternate text and can be applied on reports or when exporting response data. Each row represents the subject of a question asked in the matrix column(s). 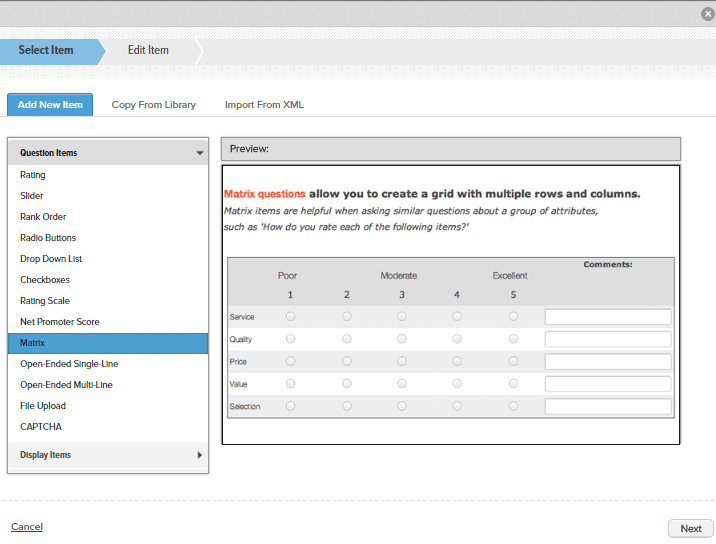 Similar to the Choices tab in other question editors, the Rows tab lets you enter variables line by line. Select the orange ‘+’ icon to add a row. Select the red ‘-‘ icon to remove a row. Select the row to edit answer text. Rearrange rows by selecting the dotted lines and dragging the answer choice to a different position. 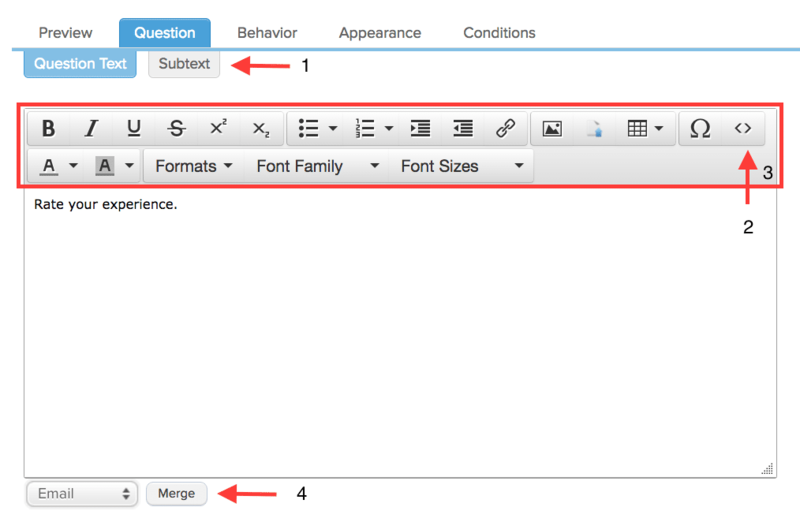 Use merging to insert the answer to a previous question, User Attribute, or Response Property into the answer choice field. Each column contains a question item, such as radio buttons, rating scale, etc. The first column in the table is populated automatically as the Row Texts column. This column represents the row labels you created on the Rows tab of the Item Editor. Rearrange columns by selecting the dotted lines and dragging the answer choice to a different position. To add a new column to the matrix, select the Add Column button. After selecting the Add Column button, a window will appear with question type options. In this example, we made our first column a Rating Scale question. Select Next to set column properties. 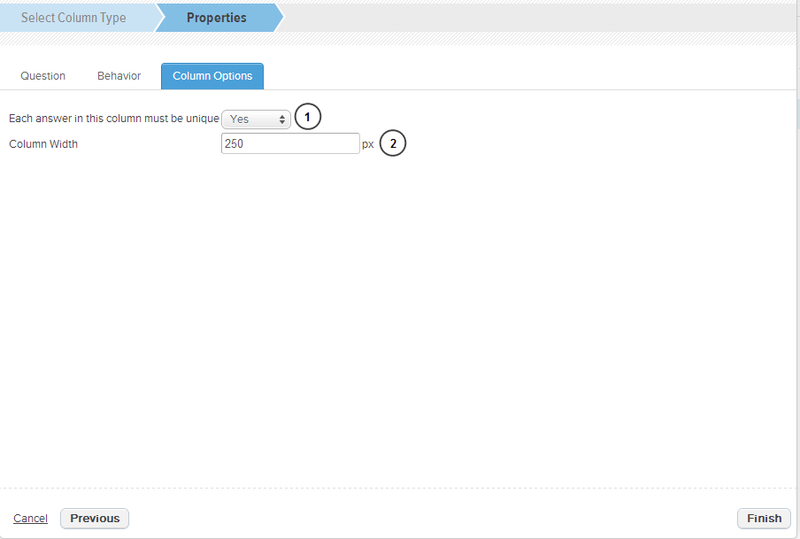 On the Properties step you can enter column question text and configure question behavior and column options. In this example, we will not include any question text. 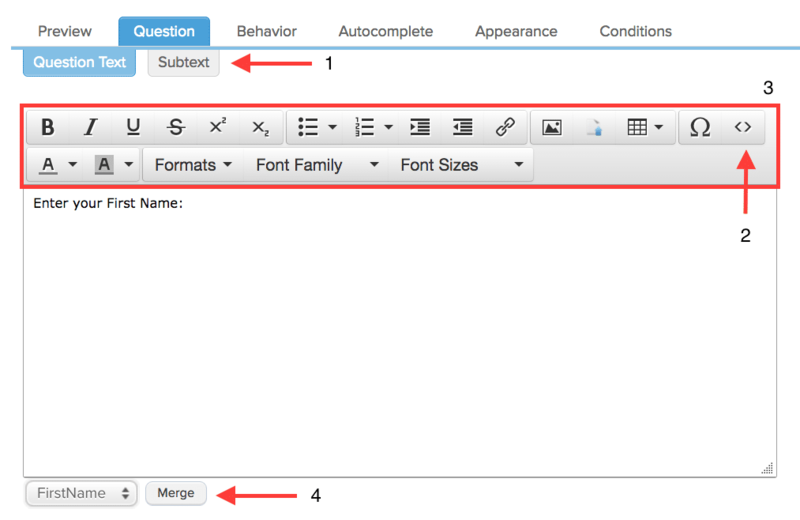 On the Properties step under Behavior, configure your question item. 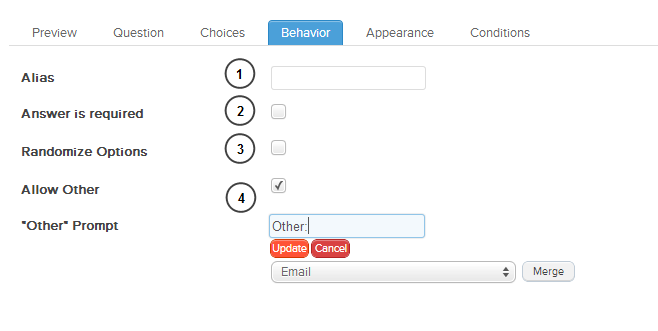 The behavior options will depend on the question type you selected on the Select Column Type step. Because we selected Radio Button, we see the Radio Button behavior options. 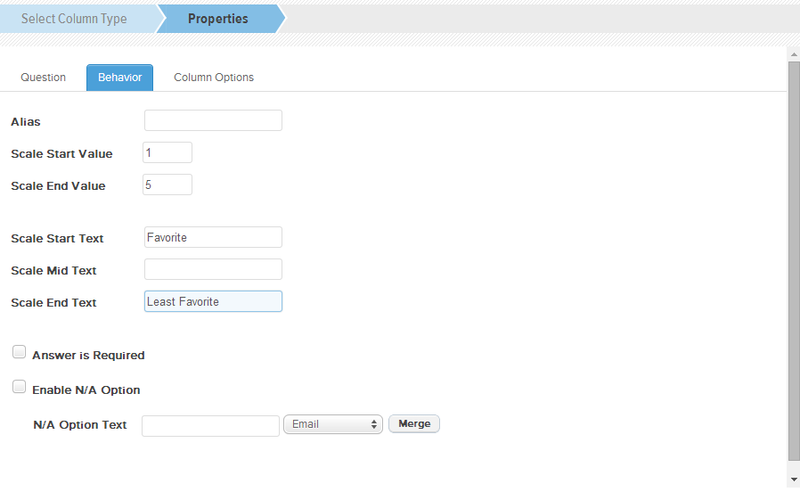 On the Properties step under Column Options, configure your column settings. Select Finish to complete the column setup process. As you can see, the new Rating Scale column has been added to the column list. Choose to add grid lines to the matrix table. Options include vertical lines, horizontal lines, or both. Set the width for the entire matrix in pixels. If you do not set column widths, they will automatically adjust to fit the matrix width set here. Change the position of the matrix text in relation to the grid. Options include top, bottom, left, or right. Change the justification of the row text within the row text column. Open-Ended Single-Line Text items are used for collecting a single line of free-form text. This type of question is useful for collecting demographic data and contact information. Specify an answer format, such as Email Address, Date, All Numbers, All Letters, etc. Checkbox will validate respondents’ answers based on whether or not they entered an answer in the format specified here. If a respondent enters an invalid format, they will see a validation alert after attempting to proceed in the survey. Limit the amount of text a respondent can enter in this Open-Ended Text item by entering a character number into the Max. Length field. Check Answer is required to make this a required question. Respondents will not be able to proceed in the survey until an answer is selected. Create a question alias. This alias acts as alternate question text and can be applied when generating a report or exporting response data. 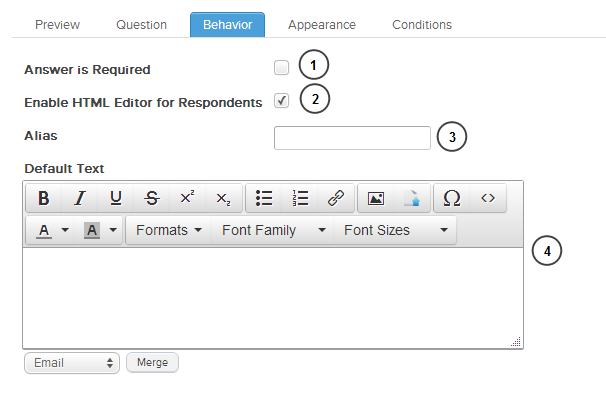 Enter Default Text here to display pre-populated text in the answer text field when a respondent enters the survey page. This text can be deleted or modified by the respondent. You may also use merging here. Choose from an existing list or add a new list. Enabling this feature means that the open-ended field will auto-populate with options to choose from as the respondent starts typing. Respondents will still be able to enter a value, not on the auto-complete list, however. This feature is helpful in cutting down on data entry errors or alternate spellings of the same word. Set the text box width in pixels here. CHECKBOX TIP: To minimize scrolling on contact or registration forms, position the text field on the same line as the question text by setting the Label Position to “Left”. Open-Ended Multi-Line Text items are used for collecting multiple lines of free-form text within a specified number of rows and columns. Formatting rules can be applied to the answer text. This type of question is useful for collecting open response answers, such as explanations, suggestions, comments, questions, etc. Check Answer is Required to make this a required question. This will place an asterisk (*) to the left of your question text. Respondents will not be able to proceed in the survey until an answer is selected. 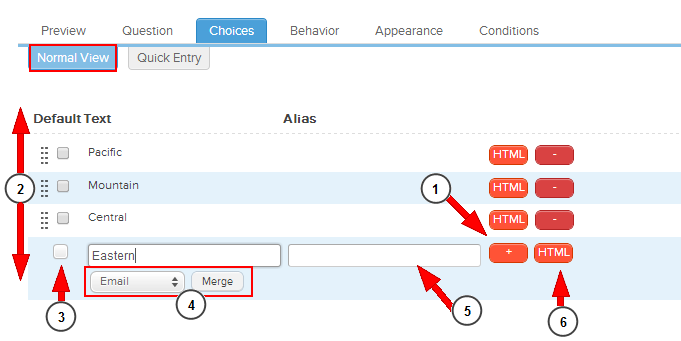 Enable the “HTML Formatted Data” option to display the text box with HTML formatting options. 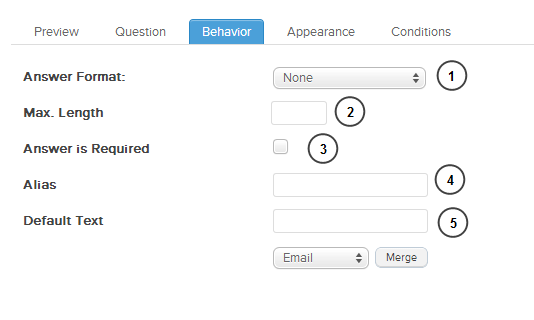 Leave the box unchecked to collect responses in plain text. Enter Default Text here to display pre-populated text in the question text field when a respondent enters the survey page. This text can be deleted or modified by the respondent. You may user merging here. 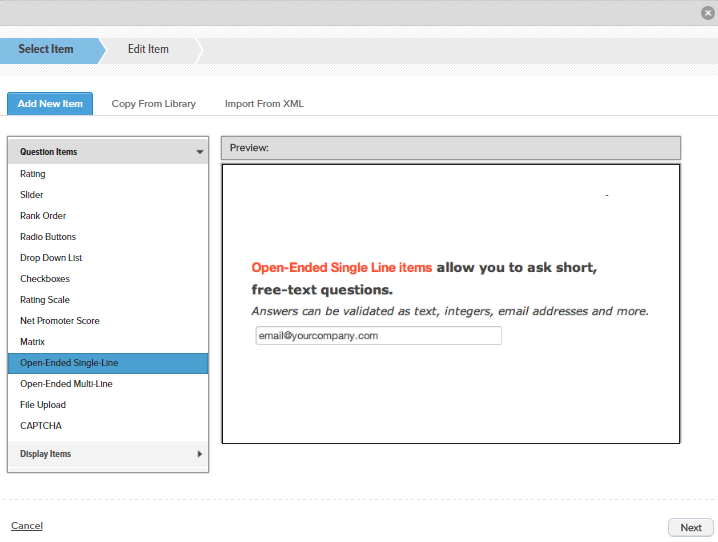 There is no limit to the amount of text you can enter into an Open-Ended Multi-Line Text item. Specify the number of Rows included in the text box. This will determine how tall the text box is. Specify the number of Columns included in the text box. This will determine how wide the box is. 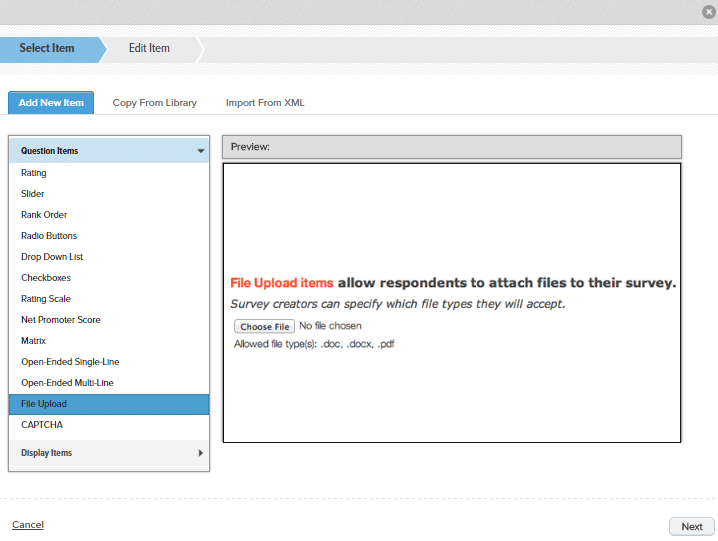 Add a File Upload input option to allow respondents to upload a file into their response. The file can then be exported along with responses. NOTE: The default maximum file size that can be uploaded is 4MB. Customers with server licenses can set the maximum file size to their specifications. Choose between the main question text and the question subtext. Use the editor toolbar to format text in HTML view. Within this editor, you can insert images, create tables, change font characteristics, create links, and more. 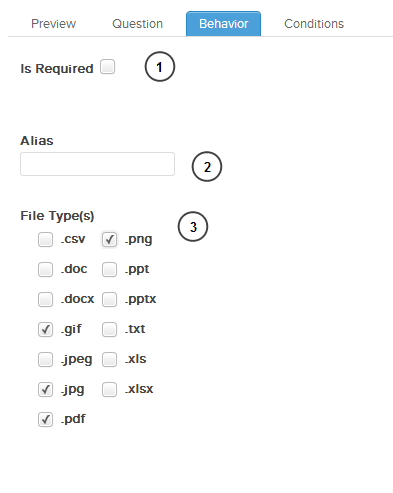 Select which file type(s) respondents are permitted to upload to their response. The file type(s) you select here will be noted on the item in your survey. 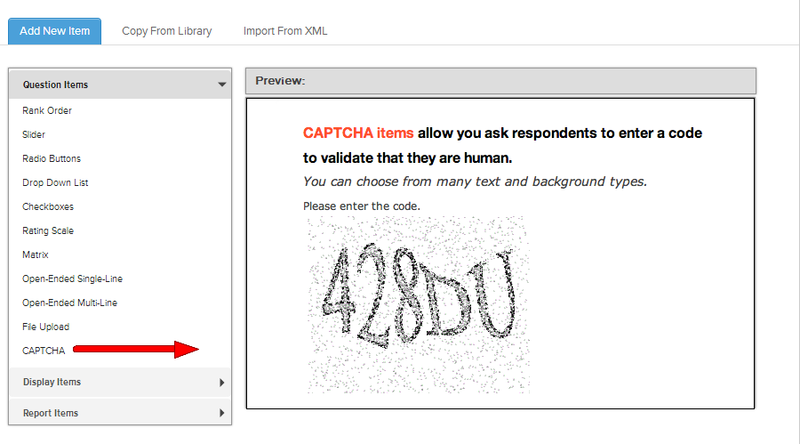 Include a Captcha validation input to protect your survey from internet bots. Captcha displays a unique code that the respondent must enter into the text field provided. If the code entered is incorrect, the respondent will not be able to proceed in the survey. Specify the Minimum Code Length of the Captcha item. Specify the Maximum Code Length of the Captcha item. Select a Captcha Code Type. Options include Alpha, Numeric, and AlphaNumeric. Set the size of the Captcha code Image Width. Set the size of the Captcha code Image Height. Determine the Image Format. Expand drop-down to view options. Select one or more Captcha styles from the Text Formats list. 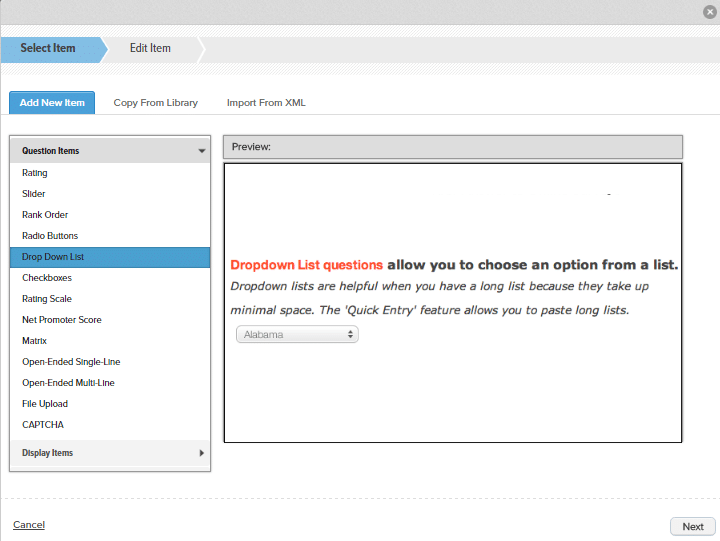 If you select more than one format, the styles will rotate when the survey page is refreshed. Use conditional logic on survey items to ensure that a particular question will only display when certain conditions are met by the respondent. 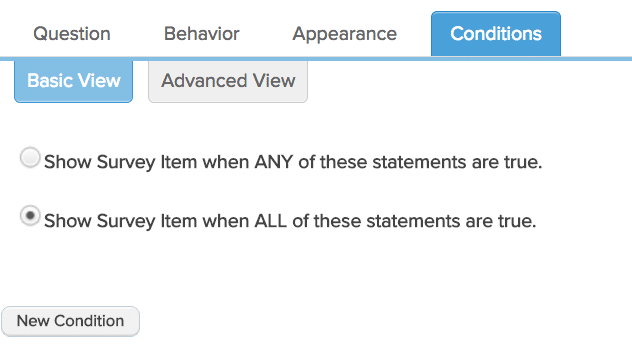 If no item conditions are set, the survey item will always* display in your survey. Read more about Conditions here.